It’s hard to imagine ordering anything low-carb at a restaurant with the words “fried chicken” in its name, but we’re here to show you it can be done! 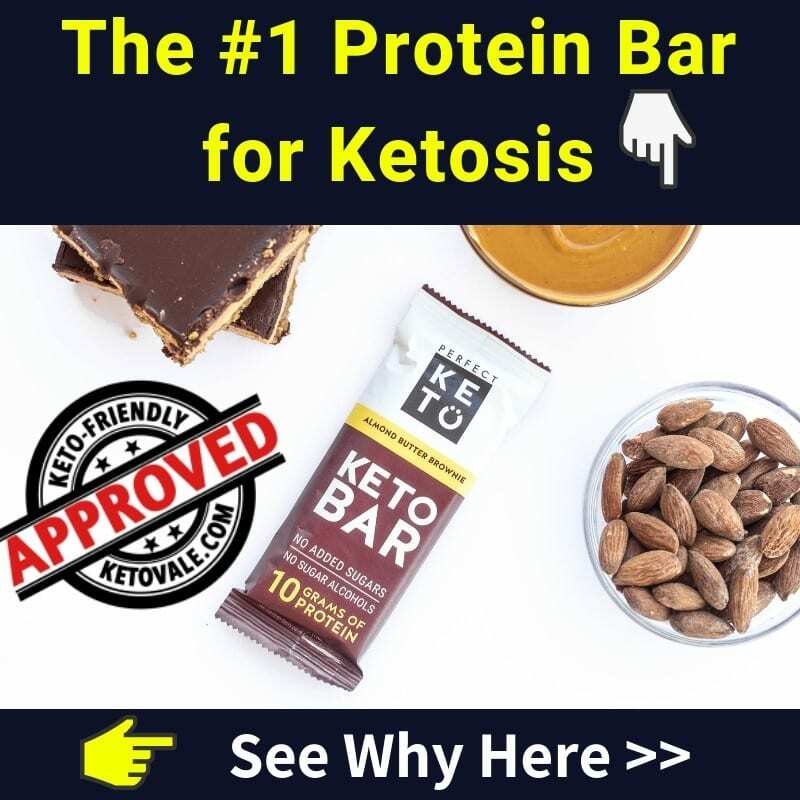 While it’s always best to prepare your meals at home using high-quality keto-approved ingredients, we understand that sometimes fast food happens. When you forget your lunch at home or realize that you forgot to stop at the grocery store on the way home from work yesterday, fast food might be your only option. If that’s the case, then you’ll want to keep in mind that fast food should never be your first choice. So don’t get comfortable hitting up the drive-through. While you can usually find something low-carb wherever you go, fast food won’t meet your strict ketogenic diet qualifications. For example, most of the meats served at fast food restaurants are cooked in vegetable oil and contain hormones, sugar, milk, antibiotics, and other damaging food additives as well as breading. You might be able to make the macros work into your low carb diet for a day, but fast food meals are not suitable for more than a once-a-month emergency. We admit that there are lots of better fast food choices around than Kentucky Fried Chicken. Even McDonald’s has more low-carb food options! Note: fast food options aren’t strict keto. It’s okay for low carb diet but if you’re following keto, try to cook your own meals and follow a healthy keto plan. But if you find yourself in need of a low-carb meal and it’s your only option, you can make it work. Here’s how. If we’ve learned anything from KFC, it’s that eating fried chicken doesn’t make you the picture of health. Still, their menu offers a few low-carb options that are finger-lickin’ good and won’t cause you to plummet out of ketosis. As the name implies, the majority of their foods are fried. So you’ll either need to become good at picking off the breading from your chicken or asking for grilled chicken instead. Here are some tips for making it work at KFC. Most of the time, fast food is a spontaneous thing. You usually don’t know that you’ll be eating there. Otherwise, you would have prepared and planned differently, especially if you’re on the ketogenic diet. But if you happen to know ahead of time that you’ll be eating KFC later, then make it worth your while by hopping on their website and looking at their nutritional calculator. It’s a handy tool that allows you to build and customize your meal so you can see your macronutrient and calorie breakdown. To use it, you’ll first need to choose your meal. Then select the item you’re ordering. You can customize your order by picking which recipe you ordered. For example, if you were to look up the nutritional information for their World’s Famous Chicken and pick the “chicken on the bone” option, you could then plug in “original recipe chicken breast” and see that one piece contains 390 calories, 21 grams of fat, 11 grams of carbs (9 grams net carbs), 2 grams of fiber, and 39 grams of protein. You could then click on the ingredients list and determine that one piece of chicken on the bone contains the following ingredients: Fresh Chicken Marinated With: Salt, Sodium Phosphate and Monosodium Glutamate. Breaded with Wheat Flour, Salt, Tricalcium Phosphate, Nonfat Milk, Whey, Potato Starch, Egg Whites, Maltodextrin, Triglycerides, Food Starch- Modified, Natural Flavor, Colonel’s Secret Original Recipe Seasoning. Let’s be honest here. The side dishes at KFC are the stuff that nutritionist’s nightmares are made out of. 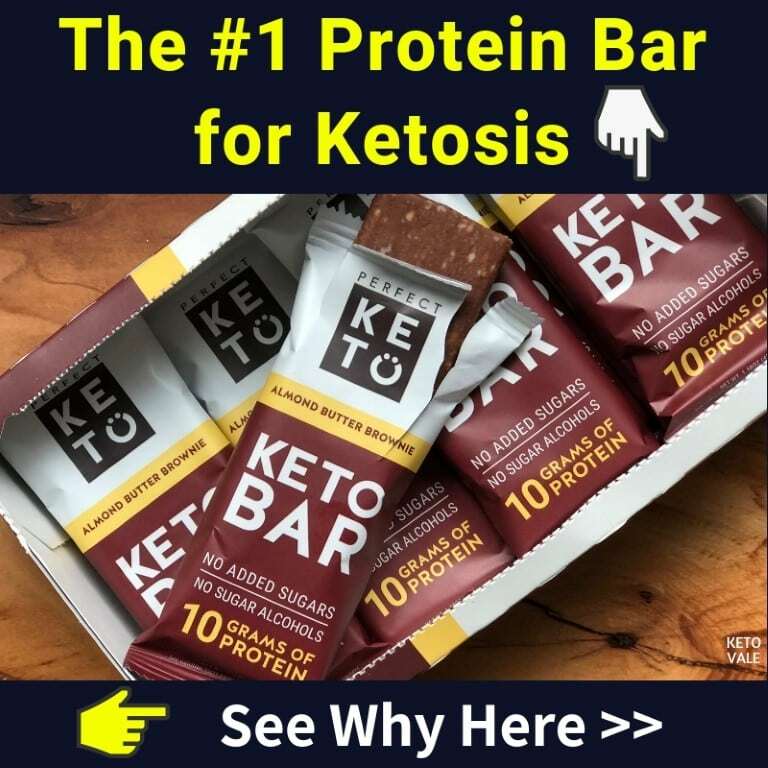 You shouldn’t eat them even if you’re not on the ketogenic diet! We’re looking at you, pot pie, biscuits, and macaroni and cheese. Even the green beans contain the food additive monosodium glutamate (MSG), which has been linked to fibromyalgia as well as negative effects on fatty tissue, the central nervous system, and reproductive organs (1, 2). Because of this, you’ll want to stick with grilled chicken and not much else. This might be tricky as most of the options on their menu state that the chicken is crispy, which is another word for breaded and fried. Always ask ahead of time if you can get your sandwich or bucket of chicken grilled to avoid the breading. Here’s another tip: go with wings instead of chicken breast for a higher fat content. We didn’t readily see salad options on the menu at KFC at first glance, but after some digging, it turns out you can get a side salad with lettuce and tomato and nothing else. This is great news considering that there is nothing else even remotely low-carb on the menu. In addition to your bucket of grilled chicken, get a side salad to go with it. This means you’ll be adding some vitamins and antioxidants to your meal. Make sure you ask for the salad to be dry as any dressing you put on it would contribute to the sugar and carb count, unless it’s olive oil and vinegar. A side caesar salad would also work. Just make sure you hold the croutons. Keep in mind that fast food flavorings are just another way to add more harmful ingredients to your already low-quality food. Here’s a perfect example. One piece of Nashville hot chicken contains 770 calories, 60 grams of fat, 21 grams of carbs, 1 gram of fiber (20 net carbs), and 35 grams of protein. The first ingredient listed on the website is partially hydrogenated soybean oil followed by brown sugar and a bunch of preservatives. Always stick with the original recipe as it means that you’ll be indulging in fewer ingredients and don’t be tempted by different preparations. If push comes to shove and your KFC accidentally gives you crispy instead of grilled chicken, then you may have to get a bit dirty and use your fingers to pick off the breading. You can always eat the inside of any crispy chicken dish by peeling off the breading and tossing it. Colonel Sanders won’t be happy about it but you just have to do what’s best for you. You may want to order a fork and knife with your chicken so you can cut off any breading. The fork will come in handy for eating your side salad with, too. If you’ve ever visited the south before, then you know that southerners love their sweet tea. The only drink option we see on the KFC menu that is suitable for the ketogenic diet is unsweetened iced tea. Of course, you can always grab a bottle of water to wash down your chicken with. But don’t expect much else in the way of beverage options at KFC. It doesn’t look like KFC has any grilled chicken sandwich options, but that doesn’t mean you can’t ask them to make you one. Just make sure to ask for a lettuce wrap instead of a bun and hold the sauce and mayo. Be warned that if you order a regular chicken sandwich from KFC, it will come crispy and probably loaded with sauce. We’re afraid the list of low-carb friendly options at KFC for breakfast, lunch and dinner won’t be nearly as long as some of the other fast food restaurants we’ve covered, but you have at least one good option: get a bucket of grilled chicken. KFC offers a few different options for their buckets of chicken. You can get an eight piece, 12 piece or 16 piece bucket. We don’t think you’ll need more than an eight piece bucket, unless you’re feeding the whole office. Always get the original recipe and ask for grilled chicken instead of crispy. And as always, hold the sauce. According to the KFC website, one grilled drumstick contains 90 calories, 0 grams of carbs, and 4 grams of fat. A few pieces should be enough to tide you over as a snack until you can get to a real ketogenic meal. These bucket meals come with biscuits, desserts, drinks, and side dishes, so save yourself the temptation and ask them to hold these. Or take them back to the office with you and distribute them to your co-workers before you become tempted to eat them yourself. The only food you can get to accompany your bucket of chicken is a side salad without dressing or croutons. The list of foods to avoid at KFC is much longer than the list of foods you can eat, but we wanted to display them here so you don’t get tempted. 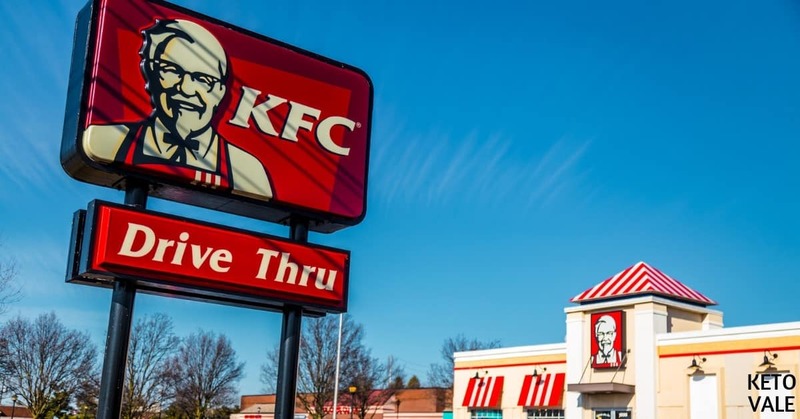 Stay away from these dishes at KFC unless you don’t mind picking the breading off your chicken. When it comes to eating fast food, there really is no ideal situation. You’ll be consuming low-quality meats with harmful chemicals, added sugars, and vegetable oils. Because of this, we recommend preparing your meals at home and bringing them with you throughout the day. If you’re craving crispy chicken, you can try making this Crispy Keto Fried Chicken and Baked Coconut Chicken Tenders. If you find yourself in a pinch and KFC is the only restaurant nearby, then go for a bucket of grilled chicken with a side salad. 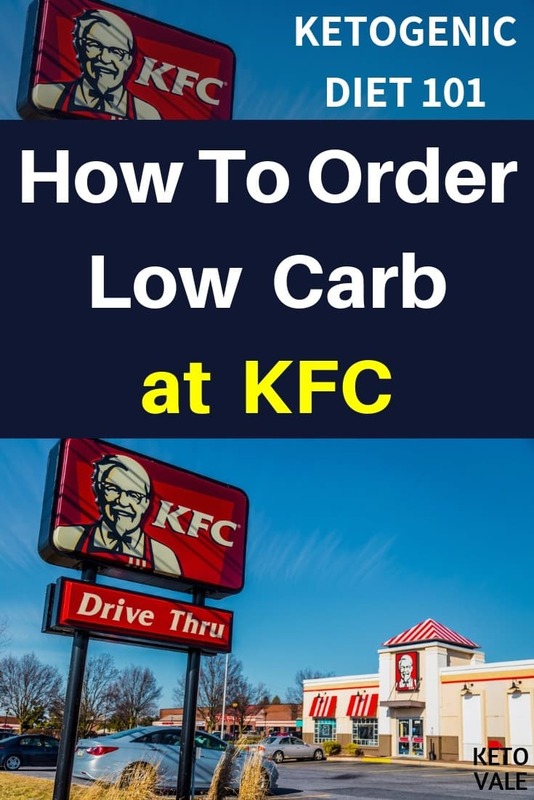 All other food options at KFC are crispy or covered in sauce, which means that they will contribute more carbs to your day then your ketogenic diet allows for.